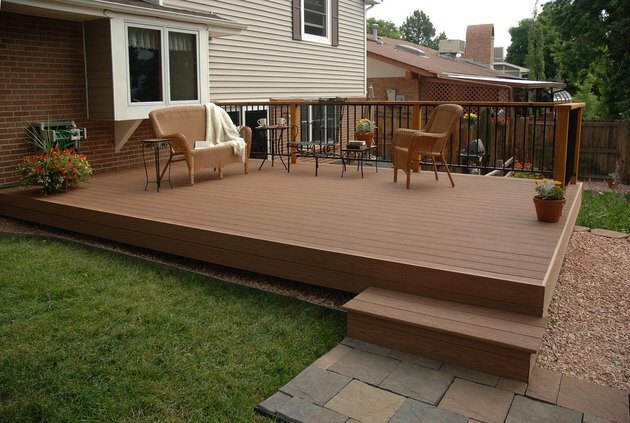 Composite decking makes a good choice for a completely weatherproof deck. In all but the driest climates, an outdoor deck will be subject to damage from moisture over time. Eventually, most wood decks will experience rot. Regular treatment of wood with sealers can help with this, but the type of material you use for both the structural support members and the surface decking and railings should be selected for its ability to stand up under moisture and ground contact. This is one reason why some composite materials made from recycled plastics joined with sawdust and other wood fibers are gradually becoming more popular, especially the visible surface areas of a deck. Pine 2 x framing lumber is the standard for indoor construction, but for outdoor use it is acceptable only in very dry regions, such as the desert Southwest, where it is frequently used for the posts, beams, and joists that support a deck. Surface deck planking is also available, but pine is a not a particularly attractive wood, so it usually is reserved for the unseen areas. The lumber sold as PT (pressure-treated) includes ordinary species of pine that have been impregnated with chemicals under high pressure to improve the wood's resistance to rot and the insect damage that follows. Nearly all dimensions of pine framing lumber are also available in pressure-treated form. Surface planking in 3/4-inch or 5/4-inch thick boards is also available for surface decking, though it is not a common choice. The vast majority of decks use pressure-treated lumber for the underlying structural members—the support posts, beams, joists, and stair stringers—with other, more attractive materials used for the visible surface elements such as decking, railings, and skirting. Cedar is a conifer species, like pine, but one that has a notable natural resistance to decay and insect attack, due to the presence of natural chemicals in the wood. The form that offers the best resistance is that taken from the center of trees, known as heartwood cedar. Cedar is not inexpensive, so it is normally used for surface decking and other exposed areas where its attractive look can be on display. The most common formula for a wooden deck will use cedar for the visible areas and pressure-treated pine for the structural members. Cedar has a very pleasing grain and color that can be left to weather naturally. Redwood is another conifer species with natural resistance to rot and insect damage, and like cedar, the best lumber will be heartwood, taken from the center of the trees. This can be identified by its darker color—heartwood redwood will be quite red, while sapwood will have a lighter, creamier tone. Once a standard decking material, redwood supplies have dwindled over time and have thus become quite expensive. A redwood deck is one that will announce itself as a premium, expensive feature of your home. In very fine decks, especially in dry southern climates, hardwoods such as teak and oak can make a viable surface decking material, where they are often oiled or stained to an elegant lustrous finish. These, and a few other tropical hardwoods, have some degree of resistance to moisture, though not to the degree of cedar or redwood. Composite materials are synthetic, man-made "lumber" products made by blending recycled plastics and wood byproducts into lumber-like boards that can be cut and fitted to use for surface decking, railings, stair treads and other visible deck elements. Originally, these products had a distinctive "plastic" look and not much appeal, but today there are many manufacturers offering very appealing composite decking with colors and textures that make it appropriate for even the most upscale installations. These products can be cut with ordinary woodworking tools, and can be attached and secured with the same screws and hardware used for ordinary lumber. Some manufacturers also offer clip systems that allow the decking to be attached invisibly, without any surface screws or nails showing. Stainless steel fasteners will have a shiny finish. 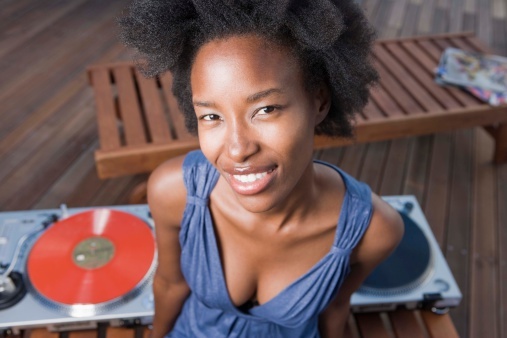 Just as woods and other decking materials must have weather resistance, so, too, must the screws, nails, bolts, and metal connectors used to build a deck have the ability to stand up to moisture without corroding. This is especially important when building with pressure-treated lumber, as the chemicals used in the wood can corrode standard screws and nails in a matter of a few years. 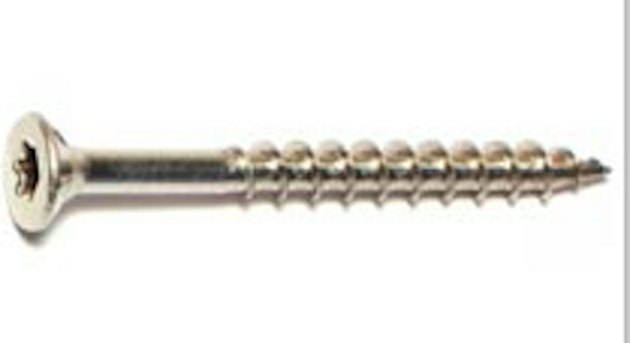 Normally, ordinary galvanized screws and nails are thought have sufficient resistane to corrosion. But modern treated lumber now sold uses ACQ (Alkaline Copper Quaternary) as the active agent, and this is extremely corrosive to standard metal connectors—including plain galvanized connectors. Make sure to buy connectors rated for use with pressure-treated chemicals.